Which Electric Carving Knife Should You Get? There are various reasons why you should get an electric carving knife of your own. For one, it takes away pretty much all the struggles that you have to face when it comes to carving meat. With a normal carving knife in your hand, you risk tearing up the meat as you carve it out, but with an electric carving knife, all you really have to do is press the knife against the meat and let the slices fall off. Because of that, an electric carving knife can significantly improve your overall speed during carving. From my personal experience, I have experienced about double the speed in carving when I use an electric carving knife as opposed to using a conventional carving knife. Another thing I liked about the electric carving knife is how it can ultimately reduce hand strain. If you were to cut a whole piece of turkey, you’d surely get tired before you get to the end. But by using an electric carving knife, you will be able to seamlessly cut even slices of poultry without performing that tiring back and forth slicing motion over and over until you finish the whole bird. These tools basically make the life of a home cook easier. You don’t have to feel intimidated anymore whenever you face the daunting task of carving a turkey or a chicken. There are numerous kinds of electric carving knives available in the market today. Each carving knife comes with its own set of functions that can either be useful to you or not. 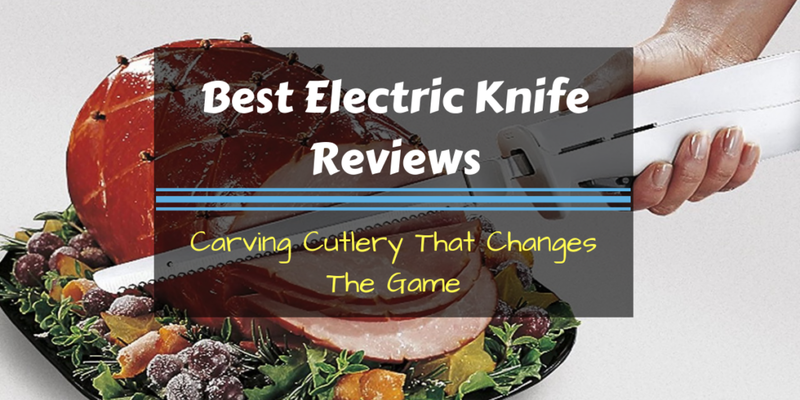 To ensure that you get a product that you will enjoy using all the time, and to make sure that you get the most bang for your buck, try to use these following factors I’m about to tell you in order to get the best electric carving knife for your kitchen. Try to go with an electric carving knife that comes with blade replacements. Even though your main purpose for your electric knife is only carving, you might as well choose one with interchangeable blades for added versatility. Electric knives today can come with several blade types for slicing, carving, and filleting. Just make sure that you get an electric knife that will be able to perform all your cutting needs. Try to go with an electric knife that you can maneuver with ease. This could mean going with an electric knife that comes with a really long cord or better yet, an electric knife that is completely portable and wireless. Do take note that each of these knives come with its own set of perks. Getting an electric knife with a cord typically means that you won’t have to worry about keeping the batteries charged. Just weigh out the pros and cons first before you decide which kind you should get. When it comes to ergonomics, try to choose an electric knife that comes with an easy-to-grip handle. Comfortable handles can affect the overall use of your device since it determines how you will be able to maneuver the knife as you carve the meat. Now that you know how to choose the best electric carving knife for your home, I’d like to share with you these five electric carving knives that I believe are the best ones in the market today. Are you sick and tired of having the responsibility of cutting up a whole piece of turkey every Thanksgiving all by yourself? Carving a bird that big is no joke, especially if you plan to get even slices of meat all throughout. Achieving perfect slices of carved poultry is no impossible feat, but it isn’t an easy one either. It’s a good thing you can always rely on a good electric carving knife to take away all the hassles you can ever think of when it comes to carving poultry. This piece from Cuisinart can become a great addition to your kitchen because no matter the overall theme of your kitchen is because it comes with an attractive and sleek looking design that will make it fit in with your other utensils. What’s great about this electric carving knife is that it comes with highly ergonomic handles that are just great for maneuvering. 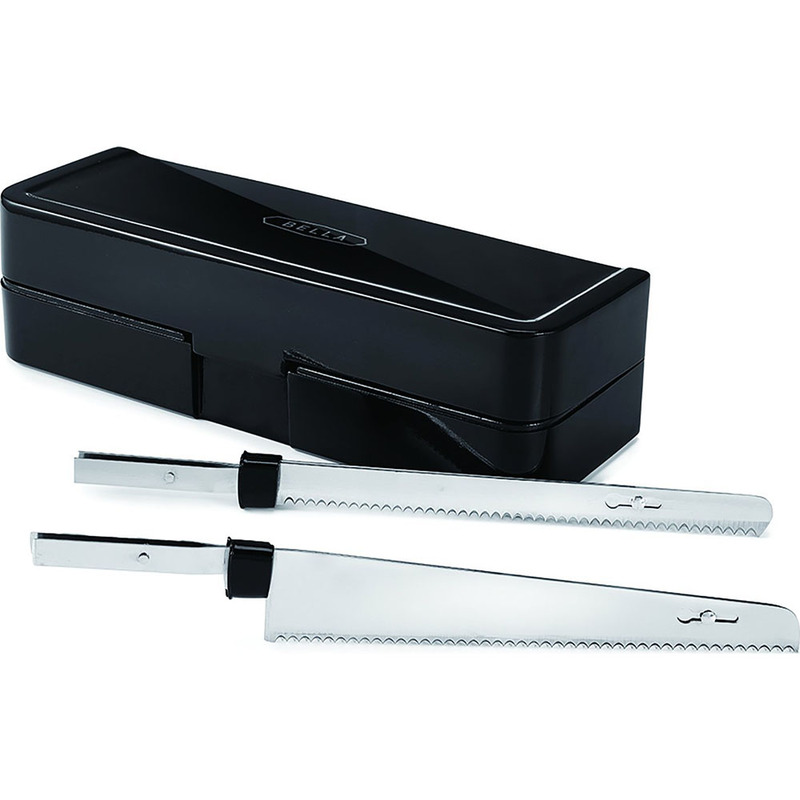 What’s more is that it comes with a set of interchangeable blades that you can use to carve meat and to slice bread. Aside from including two sets of blades, this carving knife can be quite easy to maintain since it also comes with a handy butcher block for easy and safe storage. Get those perfect and even slices of meat without having to exert much effort with the Hamilton beach 74250. This electric carving knife comes with a very classic look that will never go out of style. If you are looking for the kind of knife that you can use for years, this one may be the best choice for you. This electric carving knife is a great choice for cutting the lean meat of turkey or chicken because it comes with a thin stainless steel blade that will do all the work for you. Together with its small motor, this knife will allow you to cut a whole piece of turkey in well under 20 minutes. Another thing I liked about this knife is that it comes with handles that are very easy to grip. It comes with a non-slip trigger for ultimate maneuvering and for added safety. To make carving meat a whole lot easier for you, this electric knife also comes with a handy carving fork that you can use to get the turkey or chicken stably in place. 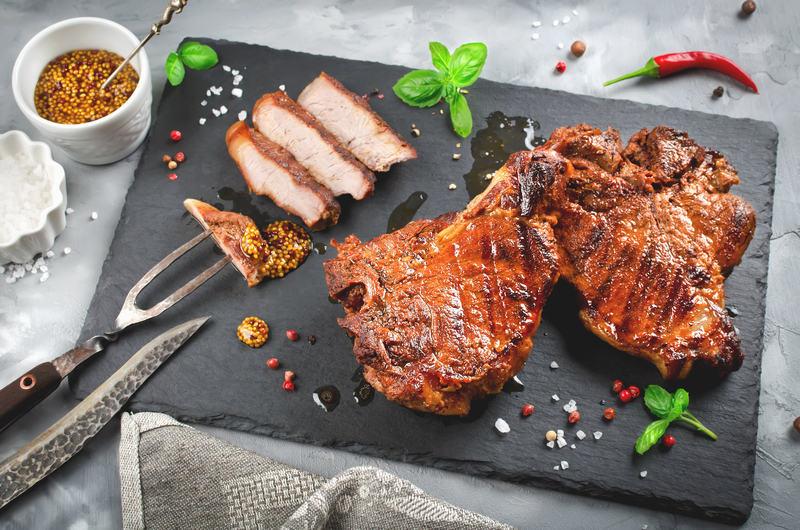 With the carving fork in one hand and the electric knife on the other, you will be able to serve fine slices of meat in your plates in no time! If you have no experience with carving meat, this electric carving knife will instantly make you feel like a pro. What I like about this knife is how it’s ultimately simple and easy to use. It also doesn’t come with a hefty price tag, which makes it within reach whether you have a tight budget or not. Another great thing about this knife is that aside from being a great tool for cutting poultry, you can also use it to perfectly cut beef, pork, and even bread. It comes with offset serrated blades that can rapidly go through any kind of ingredient. What’s more is that this knife is ultimately safe to use. As an additional safety feature, this electric knife comes with a safety lock button that will prevent the knife from turning on when it is plugged in. As for its cord, it comes with a pretty lengthy one that you can rely on to give you all the space you need to carve your meat. This electric knife also comes with highly ergonomic handles that will allow you to grip it with ease. It’s also quite easy to clean and maintain since all of its parts are dishwasher-safe and are easy to detach from the rest of the parts. 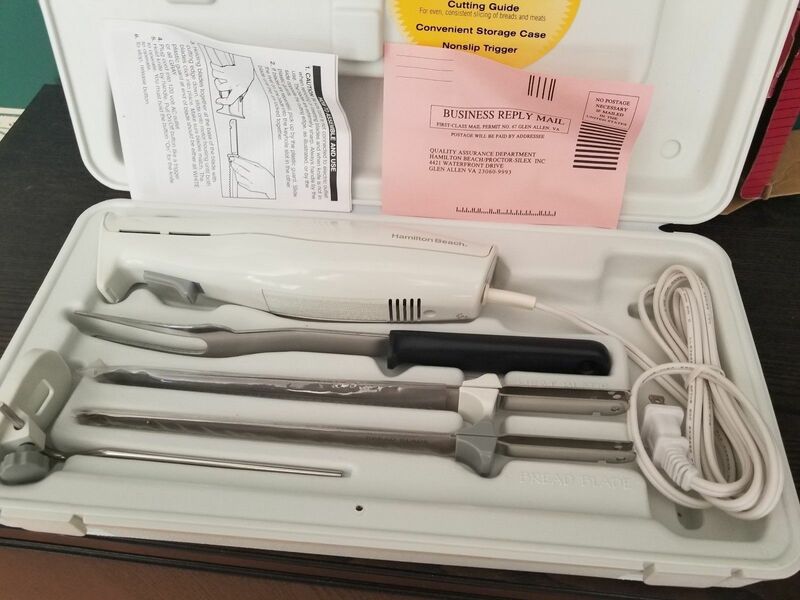 Another electric carving knife from Hamilton Beach is the 74275. What’s great about this knife is that despite having a really compact design, it performs as well as other competing brands with larger sizes when it comes to carving meat. I specifically love the comfortable handles that this electric carving knife offers. If you plan to spend some time carving a whole turkey or two, this is a device that will allow you to get the job done without getting your hands strained. This knife’s stainless steel blades can quickly go through any kind of meat. In fact, you can use it to carve roast beef, pot roast, and other kinds of thick meat that requires perfect carving. In fact, its sturdy stainless steel blades can even be used to cut through cartilage and bone. Aside from being a great tool for cutting meat, you can also use it to slice bread without deforming the bread at all. This device is also quite easy to store and maintain. You can easily store it away for future use without having to worry about scratching the blades or damaging the body since it comes with a nice compact case that can neatly store everything. There’s a reason why this carving knife has a premium price. It offers premium features, that’s why. You can get stainless steel blades that you just know will last for a long time. With just the right pressure, it can slice different ingredients such as roast turkey, chicken, ham and even softer ingredients like cheese and meatloaf. Handling is easy, thanks to its ergonomic design. It even comes with a safety lock to ensure that it will not accidentally turn on and cut your hands. It’s a cinch to use. It’s basically a plug-and-play product. You get even and perfect slices all the time. There is a safety lock to prevent accidents. It comes with a butcher block. The handles are easy to use. A little bit more expensive than the others. Our first choice for the best electric knife is the Cuisinart CEK-40 for its maneuvrability and ergonomic design. You can’t go wrong with the Cuisinart CEK-40 Electric Knife. If you want something that is durable and can last you for a long time, this can be the best option for you. 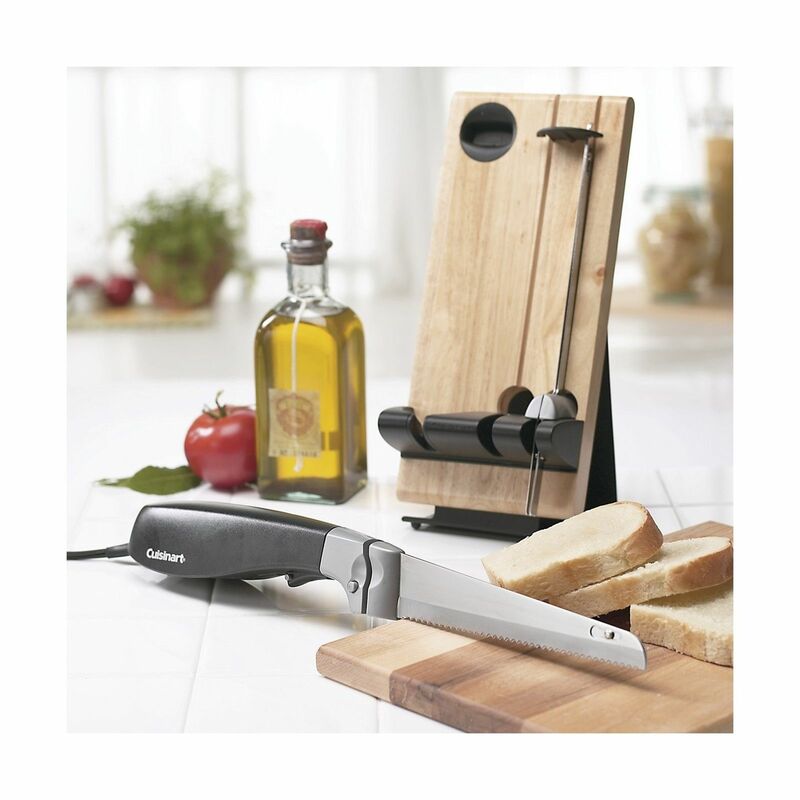 The interchangeable bread and carving knives make this a winning choice for avid home cooks. Looking for something that is less intimidating to use? The Hamilton Beach 74250 Carve ‘n Set is an ideal choice. It is not just easy to use, it is also easy to keep clean and to store. It shouldn’t take up a lot of space in your kitchen. Budget-conscious individuals out there can go for the Black + Decker EK500B 9-inch. It is more affordable, but it isn’t lacking in all the nifty features you might be looking for in a carving knife. This is ideal as a starter carving knife set and should last you through many Thanksgiving dinners. 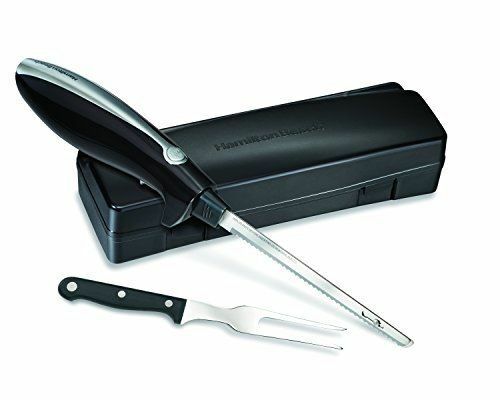 The Hamilton Beach 74275 Electric Carving Knife is a more compact knife more fitting for those who don’t have savvy knife skills. It allows you to get through those tight corners without struggling with a very big blade. The NutriChef Electric Carving Slicer Kitchen Knife is more ideal for those who are looking for a slightly more expensive and more premium model. The slices you get look like it came straight from a meat shop. It is also handy and easy to use at home. You should already know which electric carving knife to get by now. Make sure you also check out our homepage to find out what other products will make cooking in your kitchen easier.